A blog about what I'm all about: Being a Mom, loving life, good cooking, and saving a buck. I confess. I like to bake almost more than I like to eat what I've made. There have been countless times where I will bake something to bake something, having no desire to even eat the dessert I spent hours on. This is normally my attitude with muffins. I like to make sugar-crusted top, delicious muffins.... and then give them to someone else. 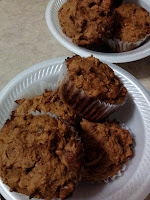 This time, however, even I could not resist the appeal of these pumpkin butterscotch muffins. The butterscotch chips in them melt, then get crispy on top- wow. They are delish. 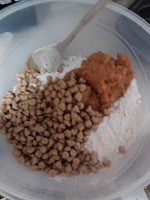 As they are basically a modification of my earlier 3 Ingredient Pumpkin Chocolate Chip Cookies, there really isn't much to it. 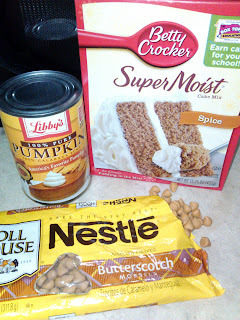 Mix these three together with a wooden spoon, then spoon into a lined muffin tin. (word to the wise, follow my aluminum foil tips to protect your pan and make it easier to clean up). Because your mix won't rise/expand, fill your muffin cups to the top. Bake at 350 for 8-12 minutes or until a toothpick inserted comes out clean. Then all that is left for you is to enjoy them! Wow I can't wait to try these!! Thanks for posting! How to Clean IMPOSSIBLE Toilet Bowls: Updated! Monday: Have Kids? Plan to? READ THIS.